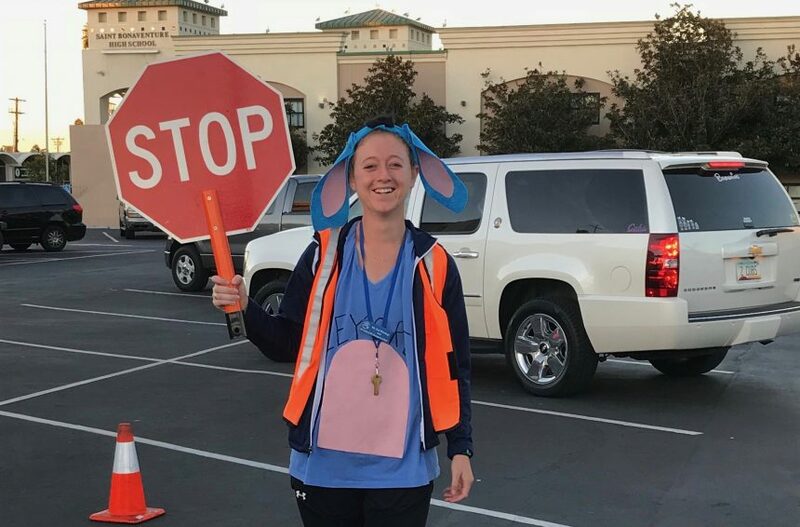 Never in my life would I have ever imagined that one day I would be dressed in an Eeyore costume with a fluorescent orange vest and holding a hand-held stop sign at a K-8 school in California. Yet, that is exactly where I found myself on Halloween morning. Since it was a Wednesday morning it was my turn to direct the crosswalk in front of the school to ensure that children and parents can cross safely. Now, I do not consider myself a very commanding presence, but there can be no hesitation on the crosswalk because these parents do not mess around. Working the crosswalk is just one of many unexpected and fun parts of the Augustinian Volunteer’s role at Our Lady of the Assumption School in Ventura. Fast forward to lunch and I was introduced to another one of those unexpected roles. The school was buzzing that day because it was the time-honored tradition of the Pumpkin Bowl. It is a kickball game played between the seventh and eighth grade at lunch recess that the children have been training for and looking forward to since sixth grade. Suddenly, I was handed a microphone because, surprise, the AV gets to announce the game. I had a blast keeping the crowd updated on runs, foul balls, and strikes while still in my full Eeyore costume. Spoiler alert: the eighth grade won. Although I am having more fun than I ever expected myself to have there are challenges as well. Middle school has changed substantially since I attended ten years ago. Middle schoolers now are facing completely different situations and stressors. Societal pressures are placed on their shoulders at a very early age with the constant presence of social media and technology in their lives. As I navigate this new landscape of classroom dynamics, I am beginning to discover that even though so much has changed these kids still want the same thing as always…for someone to listen to them. They want to be heard and they want to know that someone cares. It takes patience and understanding, but I know I’m on the right track when a kid excitedly rushes up to my desk to tell me about something that’s important to them.